GUANTANAMO BAY NAVAL BASE, Cuba A U.S. military judge is considering broad security rules for the war crimes tribunal of five Guantanamo prisoners charged in the Sept. 11 attacks, including measures to prevent the accused from publicly revealing what happened to them in the CIA's secret network of overseas prisons. Prosecutors have asked the judge at a pretrial hearing that started Monday to approve what is known as a protective order that is intended to prevent the release of classified information during the eventual trial of Khalid Sheikh Mohammed, who has portrayed himself as the mastermind of the terror attacks, and four co-defendants. Lawyers for the defendants say the rules, as proposed, will hobble their defense. The American Civil Liberties Union, which has filed a challenge to the protective order, says the restrictions will prevent the public from learning what happened to Mohammed and his co-defendants during several years of CIA confinement and interrogation. 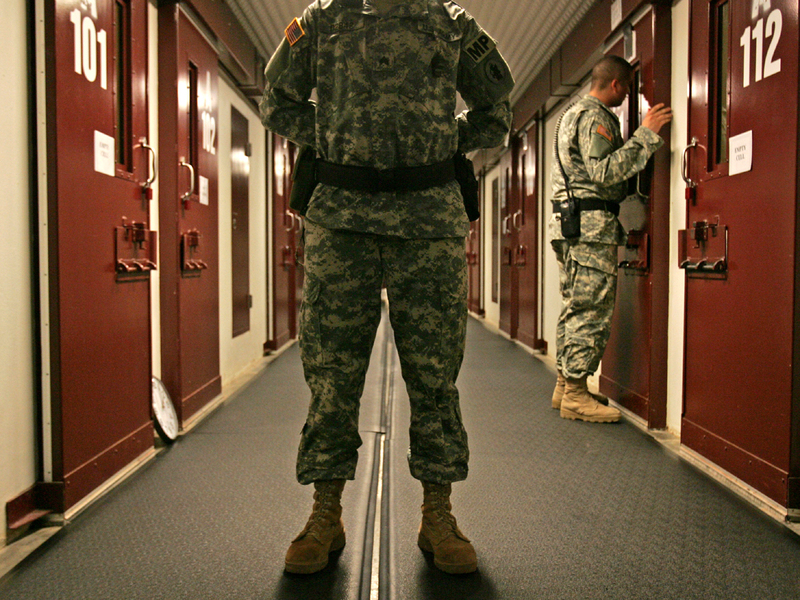 The protective order requires the court to use a 40-second delay during court proceedings so that spectators, who watch behind sound-proof glass, can be prevented from hearing  from officials, lawyers or the defendants themselves  the still-classified details of the CIA's rendition and detention program. "What we are challenging is the censorship of the defendant's testimony based on their personal knowledge of the government's torture and detention of them," said Hina Shamsi, an ACLU attorney who will be arguing against the protective order during the pretrial hearing at the U.S. base in Cuba. The order, which is also being challenged by a coalition of media organizations that includes The Associated Press, is overly broad because it would "classify the defendants own knowledge, thoughts and experience," Shamsi said in an interview. "It's a truly extraordinary and chilling proposal that the government is asking the court to accept," she said. Protective orders are standard method in civilian and military trials to set rules for handling evidence for the prosecution and defense. Military prosecutors argue in court papers that the Sept. 11 trial requires additional security because the accused have personal knowledge of classified information such as interrogation techniques and knowledge about which other countries provided assistance in their capture. "Each of the accused is in the unique position of having had access to classified intelligence sources and methods," the prosecution says in court papers. "The government, like the defense, must protect that classified information from disclosure." Army Brig. Gen. Mark Martins, the chief prosecutor for the military commissions, said Sunday that the security precautions are necessary to prevent the release information that could harm U.S. intelligence operations or personnel around the world, and not to prevent embarrassing the government or to cover-up wrongdoing. "Our government's sources and methods are not an open book," Martins said. The U.S. government has acknowledged that before the defendants were taken to Guantanamo in September 2006 they were subjected to "enhanced interrogation techniques" such as the simulated drowning method known as water-boarding. Defense attorneys say the treatment will be used to form the basis of their defense but the proposed protective order limits their ability to make that case in court and in public advocacy on behalf of their clients. "It's a way in which the government can hide what it did to these men during the period of detention by the CIA," said Army Capt. Jason Wright, a Pentagon-appointed attorney for Mohammed. "I think we need to bring the truth to the light of day on these issues." The judge's approval of the protective order, which may not happen this week, must occur before the Sept. 11 case can move forward. Defense lawyers cannot begin to review classified evidence against their clients until it is in place. The protective order is the most contentious of about two dozen preliminary motions scheduled to be heard during a pretrial hearing expected to run through Friday. Other matters include whether the defendants can be required to attend court sessions, what clothing they are allowed to wear and defense requests for additional resources for what is considered one of the most significant terrorism prosecutions in U.S. history. The families of people killed in the Sept. 11 attacks have been invited to military installations in New Jersey, Massachusetts, Maryland and New York City to watch the pretrial hearings, which are closed to the general public. An earlier round of hearings in May was also transmitted to viewing locations for relatives of the victims, survivors of the attacks, and emergency personnel who responded to the disaster. Eight family members were viewing Monday's proceedings via closed-circuit television at Fort Hamilton, a U.S. Army base in Brooklyn, CBS News reports. "It's very hard to go into those courtrooms," Jim Riches, whose firefighter son, Jimmy, died at the World Trade Center, told CBS New York station WCBS-TV. "You sit there and you watch these men smirk and laugh and say that they're proud of what they did and then nothing gets done. There's nothing but motions and movements. The trial hasn't even started yet." Mohammed and his four co-defendants are being prosecuted in a special military tribunal for war-time offenses known as a military commission. They were arraigned May 5 on charges that include terrorism, conspiracy and 2,976 counts of murder in violation of the law of war, one count for each known victim of the Sept. 11 attacks at the time the charges were filed. They could get the death penalty if convicted. Mohammed, a Pakistani citizen who grew up in Kuwait and attended college in North Carolina, has told military officials that he planned the Sept. 11 attacks "from A to Z" and was involved in about 30 other terrorist plots. He has said, among other things, that he personally beheaded Wall Street Journal reporter Daniel Pearl. The other defendants are Ramzi Binalshibh; Walid bin Attash; Mustafa Ahmad al-Hawsawi; and Ali Abd al-Aziz Ali. Their arraignment was an unruly, 13-hour proceeding in which the defendants stalled proceedings by refusing to use the court translation system and ignoring the judge. Debra Burlingame, whose brother, Charles, was the pilot of American Airlines Flight 77, said it was disturbing to watch the suspects showing disrespect to the court and their own attorneys during the spring hearings. "One of the defendants made a paper airplane and balanced it on the top of the microphone to mock the victims and their families," Burlingame told WCBS-TV. She plans to attend the latest round of hearings sometime this week and feels she needs to be there. "I think it's very important for the world at large to know that the families have not forgotten," Burlingame said. Subsequent hearings to handle pretrial motions were postponed because of scheduling conflicts, the Muslim holy period of Ramadan and Tropical Storm Isaac. Several more pretrial hearings must be held to litigate hundreds of motions before the start of the trial, which is likely at least a year away. On Monday, the five prisoners apparently chose to forgo the protest from their arraignment. Mohammed and his four co-defendants sat quietly at the defense tables under the watchful eyes of military guards. Al-Hawsawi calmly responded to the judge's questions about his request for additional legal counsel.